CTET 2019 notification released and CTET 2019 online application form apply process is going on CTET web portal. Please read all the details about CBSE CTET 2019 Online Application, Admit Card, Answer Key, Result below in this post. CTET 2019 entrance exam is now conducted by the Central Board of Secondary Education (CBSE) and CTET means Central Teachers Eligibility Test. CTET 2019 Exam Dates has been announced will be held on 7th July 2019. CTET 2019 Application Form has been released by 5th February 2019 and it will continue till 5th March 2019. Central Teacher Eligibility Test (CTET) is only conducted for the for the appointment of teacher in the country to bring national standards & benchmark of teacher quality in the recruitment process. It will include standards of teacher education institutions & students from these institutions to improve their performance. Here in CTET 2019 exam two levels of paper. Candidates have to clear paper-I to be a teacher of class I-V & paper-II from class Vi-VIII. CTET pass candidates can teach in any government & private schools referred to the clause of section 2 of the RTE Act. All Eligible applicants are requested to read all the guidelines mentioned by the NCTE before applying CTET from the official website. Candidates need to apply for CTET 2019 proceeding the due date. No application will be received by the CTET conducting authority after the due date. Online Form Application Fee will be paid through E-Challan or Offline mode and Online Mode. You have to pass Senior Secondary (or its equivalent) with at least 45% marks or appearing in final year of 2- year Diploma in Elementary Education (by whatever name known), in accordance with the NCTE (Recognition Norms and Procedure), Regulations, 2002. Candidate must have passed Senior Secondary (or its equivalent) with at least 50% marks or appearing in final year of 4- year Bachelor of Elementary Education (B.EI.Ed). you should be passed Senior Secondary (or its equivalent) with at least 50% marks or appearing in final year of 2- year Diploma in Education (Special Education)*. You must have passed Graduation with at least 50% marks or appearing in 1-year Bachelor in Education(B.Ed). Candidate should have passed Graduation with at least 45% marks or appearing in 1-year Bachelor in Education(B.Ed), in accordance with the NCTE. A candidate has to passed Senior Secondary (or its equivalent) with at least 50% marks or appearing in final year of 4- year Bachelor in Elementary Education (B.EI.Ed). You should be passed Senior Secondary (or its equivalent) with at least 50% marks or appearing in final year of 4- year B.A/B.Sc.Ed or B.A.Ed/B.Sc.Ed. Candidate must pass Graduation with at least 50% marks or appearing in 1-year B.Ed. (Special Education)*. To know exact or accurate eligibility please click read official notification below in this post. Candidates can pay CTET 2019 application fee through online by using Credit Card, Debit Card or Net Banking of any Nationalized Bank and also offline mode through e-challan. 1. CTET 2019 online application form will be available on 05th February 2019. 2. Candidates should visit the official site www.ctet.nic.in for an application form. 3. Next click on CTET 2019 Application form to must fill all details correctly online mode. 4. Next, you click on the apply button first. 5. Then the candidate can pay application fees by means of E-Challan. The CTETAdmit card 2018 will available by CTET authority before one week of CTET exam and candidates can download their admit from online mode only from the official website of CTET and can download admit card through a link in this post also when it will be available. First, visit the official website of CTET. Next, find the correct link to download CTET Admit Card 2019. Here in the next page, you should enter your application no and password to sign in to your dashboard. Next page in your dashboard finds "Download CTET ADmit Card 2019". Click on and download your admit card and save it for appear CTET exam 2019. 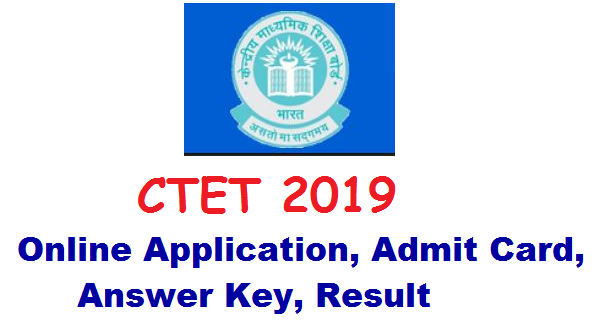 Next, you find the correct link to download CTET Answer Key 2019. Choose your paper and click on. Click on and download your answer key. Save it to calculating your marks. 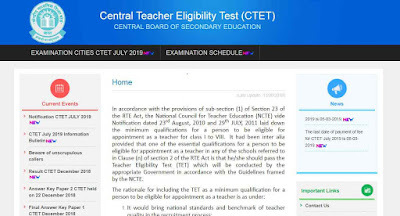 The CTET Result 2019 will be accessible on the official site. Candidates can see their result and can download a duplicate of result from the official site. Next, find the correct link to CTET Result 2019. Here in the next page, you should enter your Roll no and Date of Birth. Note: Before applying, if you don't mind visit the official site and read official notice. I think you like this post very much and helpful to you. 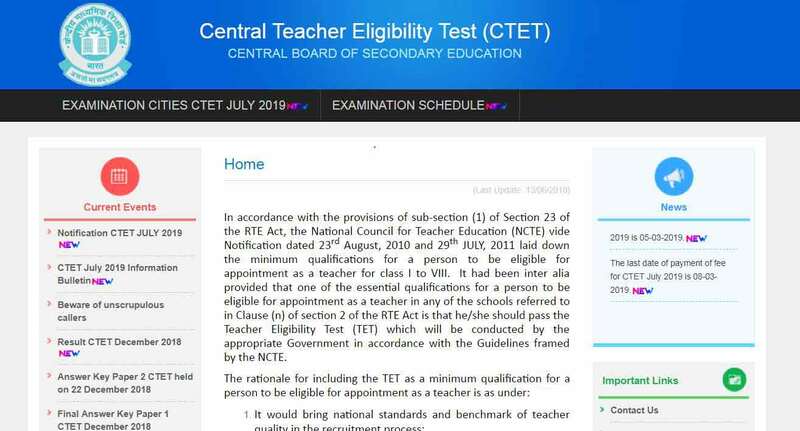 Please keep regular visit for more Central Teacher Eligibility Test ( CTET 2019 ) updates and CBSE CTET 2019 Online Application, Admit Card, Answer Key, Result. Please share this post to your friends and relatives.